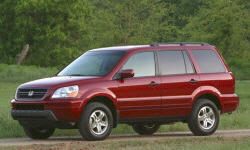 2004 Honda Pilot Pros and Cons | Page 1 of 1 | Why Not This Car? What drives people to buy (or not buy) a certain car? 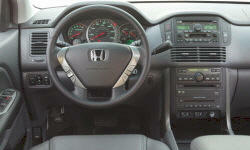 TrueDelta's members share 2004 Honda Pilot pros and cons based on their real-world driving experiences. I do like the room the pilot has. Great for families with kids. We owned a subaru outback and we were cramped. At over 5 years age and purchased new, we have had no major breakdowns and only one major recall to adjust the transmisson oil jet for 2nd gear. The Pilot seats 8 people comfortably, the 3 seats in the far rear are better for kids than for anyone 6 feet tall, but this much capacity makes travelling with friends and family a breeze.